Kingdom of God Media: Are You the Kind of Person That Sees Signs? 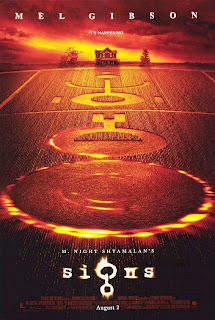 Signs stars Mel Gibson as Graham Hess (former Catholic priest), Joaquin Phoenix as Merrill Hess (Graham's younger brother) and M. Night Shyamalan as that guy who always shows up in M. Night Shyamalan movies. Since Graham used to be a Catholic priest, his family and his community are in the habit of looking to him for spiritual guidance. Most people can't help calling him "Father." But Hess does his best to correct them: He is not a priest anymore. At the onset of the alien invasion, Graham talks to Merrill about why these lights might be showing up in the sky. According to Graham, there are two ways to look at the world: Either God is interacting with our everyday life or everything is decided by chance. When a good thing happens, we can either believe that it was a blessing from God or it was dumb luck. But Graham's decision to hate God belies his overtly level-headed evaluation. If he really believed that God didn't exist or that things moved along by chance, then he wouldn't be angry at God for his wife's gruesome death. Graham was in an undeniably difficult situation. It would be almost impossible for anyone in his position to recover from such a crippling loss. Even still, everyone around him looked to him for encouragement, to reassure them that God is still looking out for them. Graham's role in his family and surrounding community, whether he liked it or not, was to lead by faith. At one point he declares to his family, "I am not wasting one more minute of my life on prayer. Not one more minute. Understood?" He's hurting and no one can blame him. But God's tenacious grace wins out in the end anyway. No matter how Graham tries to cling to bitterness and anger, this is not enough to fend off God's tenacious love. When his son's life is on the line at the end of the movie, he looks to God once again for mercy. But God never stopped looking out for him and his family, even during that dark hour when he lost his wife. In fact, at the very time that Graham hated God the most, God was setting in motion a chain of events that would eventually save Graham and his family. Graham rediscovers his faith in light of these unexpected circumstances, through which God demonstrated, beyond all doubt, that He is divinely trustworthy. If you hate God, then go ahead and admit that to Him directly. He can take it. Ask Him to work it out; some way or another He'll make it happen. This is a central reason why Christ visited planet earth, to work out our reconciliation with God. This is a real-life, sometimes painful process. Most people don't want to give up their self-righteous anger or bitterness, but this is a necessary part of the process. But, like I said, God will work it out. Thanks for stopping by our blog & leaving our first real comment. I was so delighted to visit yours & find one of my favorite movies on the first page. While, Signs certainly has its weaknesses (revealing the alien at the end, for one), it is a fantastic movie about faith & choosing to believe that God is working for us even in our darkest circumstances. While Shyamalan may have made some misteps recently, I'm still rooting for him. He has the ability to translate spiritual concepts into visual stories. And he is amazing at family drama. That last dinner (not wasting one moment on prayer) rings true, a really ugly family scene. One nitpick: I think Graham was an Episcopal minister. If he was Catholic, he wouldn't have a wife & children. I have never watched the film Signs before, but I plan to seek it out in order to try understand your "indepth" review of the film.